I love flowers and I love getting flowers, but in classic Erin style, flowers are stressful to me. Why is it if I am not stressed by a client deadline in 5 minutes (so not stressed, in fact, that I am actually blogging about the stress of flowers instead of stressing about my deadline) do flowers stress me out? The answer is not clear to me at all. Maybe it's because I know they have a very limited shelf life and I feel compelled/drawn almost obsessed to mentally document the stage they are at... new tight buds, slightly open, full bloom... even the wilting and then dying. It must be that the whole process - from receiving them to trash can (minus the one I save for posterity) is so stressful because I want to keep them on my kitchen table, I want them for longer than I know I'll have them. I want to avoid the inevitable trash can. This is probably why many of you have seen wilted, crinkly vases of dirty water and flowers still on the kitchen table, it's not that I'm lazy (although I am) it's that I haven't yet had the heart to throw them out. Anyway, I'm sure a psychologist could analyze the hell out of me by this post, but really, my original intent was just to subject you all to some of my flower photos, after all, I have 8 million photos of them! Just like it was yesterday, I can still see Tommy and Michael standing on coolers clinging for dear life to the handles on the sides of the limo bus. They are dancing and singing to sweet melodies like Ludacris's Get out the Way and Action Mrs. Jackson, I am for REALLLLLLLLLL.... it's an amazing atmosphere full of genuine excitement and I'm trying to take it all in knowing it's a fleeting moment in my life, but one with such significance. It's real, we're married and all these crazy people on this bus are here to support us and to celebrate with us because they are genuinely excited for us, well, that and we have free beer on the bus. Waking up in my house where I'd spend 27 years growing up and going downstairs to find mom working on last minute favors (we won't go there) and seeming so excited and happy even though now I realize that must have been a day filled with lots of mixed emotions for them. White balloons on the lamppost and more white balloons all around town (Tim's house, Tim's parents house) set out by my parents earlier that morning so we would all awake to a nice wedding day surprise. My dad trying to pull a last minute swap on my father/daughter dance song to the schmaltziest, tug at your heart strings Barbara Streisand song (shocking, isn't it?) but, it was classic dad and just added to the funny moments of the day. Stepping out of the van onto Mary Queen's parking lot and have the reality of the day hit me and having a serious fight or flight instinct and for one brief moment thinking about being the runaway bride - obviously, I got over it. Dad walking me down the aisle and doing a last minute brush over of my veil as we almost forgot the blusher as the doors opened. Walking down the aisle and thinking "oh my god, that's Delant, I'm actually marrying Delanty", it most definitely felt surreal. Walking out of the church as husband and wife and having a few minutes to ourselves that was the most perfect time. Dancing with both of my Grandpa's and listening to them talk about their brides of 50 and 60+ years and how to "not sweat the small stuff", to say the least, it was pretty special. In the interest of time and so as not to completely indulge myself, I will just say these are some of the major things I carry with me from the day. 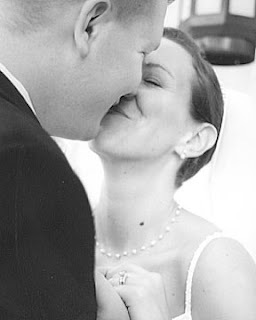 There are so many more little moments that I can remember and hopefully always will, but the moral of our wedding story has to be that, it's true what they say, you can stress and stress about pantone colors and program paper and every minute detail until you go crazy, but looking back 5 years removed, those things just aren't what I remember. What really matters five years later? That's easy, the same things that mattered five years ago today: Good friends, a loving and supportive family, Tim and I becoming a family and of course, a little Ludacris and some free beer. Yup, here's some more photos of this day, you didn't think only two would suffice did you? 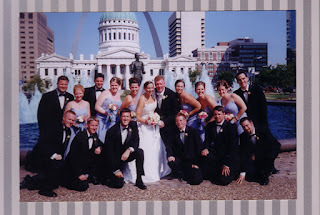 I scanned some pics from Sheryl's wedding scrapbook for us! Kim - you made the scrapbook, too! Happy 5th Anniversary to Mark and Kim's first date, too! Gladys: Marge, isn't that the third time this week that Oscar's been in here on your lap? Marge: Oh crap! Oh noo!!! I've been thinking this cat was spending a lot of time in here lately.... well, it's been nice knowing you Gladys, but it looks like I won't be making that quilting class next week. Gladys: Somebody really needs to do something about this cat. I just hate all the D$#& photo shoots. Yes, Mark is wearing a fleece in our living room. It's a work of art, isn't it? Although, I do at times feel challenged by the black vs. pinto bean debate - usually managing to royally pi$$ off the 18 people in line behind me as I oscillate back and forth between the two (indecision may or may not be my problem). Too bad you really can only eat about 1/8 of it without using up all your calories for the week in one shot, so, please sign this. The world needs smaller burritos, people! Happy Mexican Food Monday everyone and, no, I really do not have this much time on my hands in case you were wondering. It all started Thursday of vacation week. We were getting ready to go somewhere and I was hurriedly trying to get babygirl to finish eating. She was being kind of fussy about it and kept putting her hand up as if to say, "hold it woman, I'll let you know when I am ready to continue...". Well, after a few rounds of this, I looked at her and said "look, missy, there is only room for one snickelfritz in this family, and I took that position 30 years ago." Hmm... you think you're the only one in this family that can be a snickelfritz? I don't think so lady, you've got another thing coming. biggest and BEST snickelfritz ever. What, little old me? What did I do? Aren't I just the sweetest cutest thing you've ever seen? My brother in law (and I'm not saying which one here to protect his anonymity) thinks that in 90% of married middle-class families, the woman always plans and prepares dinner. Only one -third of people under age 30 say the woman usually plans dinner, compared with 62 percent of those aged 70 or older. To the best bad vacation ever! Due to lack of time since returning home from my 8 wonderful days and one terrible night away, I haven't had time to properly discuss the highlights from our first vacation with babies. So, in true Ehlert/Delant fashion, I've compiled a recap of moments I can remember in my head. A-Le, Mike, TPD, BAD and MWM, if you have anything to add, please let me know. I told you we wouldn't leave until 2pm. They said she was VERY crabby today, not at all like herself. She must be tired, she's been sleeping for like 2 hours. Ugh.. we've been in this traffic forever- what is the deal here - we're only to Mount Vernon. She just threw up - like projectile, all over everything throw up. The hospital is two miles that way. Oh good, fat babies are so hard to put IV's in. She's held the gatorade down for 30 minutes, I think we can get you guys back on the road again. Do you want to start driving and see how she does? Does a cow really weigh more than a car? Oh, I love that stinky ocean smell - we are finally here! I wonder if giving her dramamine was the best idea - who am I kidding, I might give her dramamine every day from now until she's 20. When are the Muldrow's going to get here? We've run out of things to say after 5 years. Babies all want to go to sleep now? Has anybody been to the beach yet? Uh-oh, my stomach isn't feeling so good. Look at that awesome lightning. My dad would not like us out here in this. Sparky needs his socks for golf. Oh my god Aimee HELP! Have you ever seen this much poop everywhere? Sparky is off the sauce today. Crash... Aimee, did you just walk into the screen? Should we go to the beach now? My stomach feels kinda bad. Sparky is back on the sauce. Bang, thud, smack.... You're the only person I've ever seen fall over while sitting down. 2 for 1 margaritas -yes! Anybody want to go the beach? Do you guys ever not do laundry? Michael, that is not a dirty diaper smell, I think he threw up. Let's go to the beach ALREADY. Well, sir, I can stack three high chairs, but I don't know if that's safe. That is enough food for 8 people, tpd. Tim ate more than Michael and I did combined. My stomach's not feeling so great. It's so beautiful, I don't want to go home. I will call that one flaming stars of glory. That one is shooting comets. There are so many dead fish everywhere. I still don't want to go home. See, they don't even have alligators here, tpd. I wish the Muldrows were here. I don't feel like packing right now, I feel like relaxing. Can't we go to both McDonald's and TacoBell? I am not your mom and dad, only one restaurant per stop. Here's to the best bad vacation ever! always enjoys the eye candy on the beach beautiful ocean view. Pouring one out for our homies, Sparky even pays tribute by not wearing socks. Man, Matthew is McDreamy in those cool shades. I'm tired of these "4th of July" photo shoots, how about you? Minus the night in the ER, we're having a great time! Plenty of details to come later, but here's a sneak peak of how we're all doing now!